Our New Menu Is Here! Comments Off on Our New Menu Is Here! Stop by and try something new! We are now featuring new options on our lunch menu, don’t worry we are still able to make all of your old favorites as well! Pick up a 600 EAST Café mug or tumbler today and you’ll receive 10% off your beverage purchase each time we fill it. Your wallet and the environment will thank you! Comments Off on Custom Sandwiches Now Available! In addition to selecting a delicious signature sandwich, wrap or salad, you can craft your very own lunch masterpiece at 600 EAST Café! 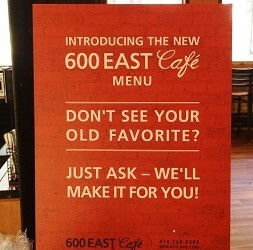 600 East Cafe Now Open to the Public! Comments Off on 600 East Cafe Now Open to the Public! M–F 6:30 a.m. – 4:00 p.m.
M–F 8:30 a.m. – 5:00 p.m. Need a space to work or meet? Learn more about our three conference rooms and seven office spaces available for rent.